Arseniy Yatsenyuk interview: The Ukrainian prime minister discusses Russia, Putin, and help from the West. 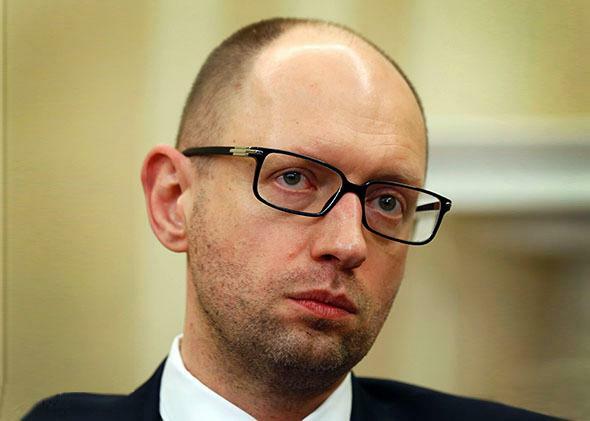 An interview with Ukrainian Prime Minister Arseniy Yatsenyuk. Ukraine Prime Minister Arseniy Yatsenyuk in the White House on March 12, 2014. How do you see the situation in the east of Ukraine? We have clear evidence that Russia supports these so-called peaceful protesters with machine guns in their hands. Russian security forces deployed groups of 10 to 20 people in different areas, and these groups have a widespread network of local protesters. That’s what our intel says. They storm the administrative or police buildings, then they disappear and local protesters occupy these buildings. Then the well-trained Russian security forces move to another destination. That’s what happened in Donetsk and Luhansk. We just got the latest opinion polls from Donetsk and Luhansk. Only 10 percent of those who live in the Donetsk region support integration with Russia. It seems that all the demands for the protection of Russian-speaking minorities were actually launched by Russians. Despite this, my government has launched a comprehensive constitutional reform because we believe we need to decentralize power and to empower local authorities. So there is no threat to the Russian minority in Ukraine, as the Russians maintain? Look at the [Organization for Security and Co-operation in Europe] report: It says there is no threat to Russian speakers. The Russians started this in Crimea, and they decided to move from Crimea to southern and eastern Ukraine, to split Ukraine and eliminate Ukrainian independence. This is the goal of Russia. To restore the Soviet Union, they have to eliminate Ukraine as an independent state. On this road to hell, they need to undermine the Ukrainian presidential elections that are scheduled for the 25th of May. Since the Geneva meeting, has there been any progress on the ground? On the Geneva deal, the Russians have done nothing contrary to the Ukrainian government, which introduced to parliament an amnesty bill. [A bill] saying that if the people come out of the buildings they will get amnesty? Yes, if they leave the buildings and give up their weapons they will not be prosecuted. We established a constitutional commission and had a long debate over what kind of new constitution my country needs. The Ukrainian people need to know what kind of powers this new president will get. Because power needs to be split between the prime minister and the new president? Between the government and the president. In Ukraine, the president has no executive authority, but he still has powers that can be envisaged as executive, so we need to be very clear in saying Ukraine has to restore the balance of power between the executive, legislative, and judiciary. Will the elections be held? Yes, we will do everything to have these elections be free and fair. Do you think [Russian] President [Vladimir] Putin will have his troops sit on the border of your country or will he invade? This is not only the question for me but it is the question for which everyone in the world wants to find an answer: What is the ultimate goal of President Putin? I’m not sure he even knows. Presumably, his goal is to restore the Soviet Union and build up a new, bipolar world. To achieve this target, he has to invade Ukraine, conquer Moldova, and grab Georgia. But Ukraine plays a pivotal role. This is the key pillar of his empire. He isn’t the first one to think like that. Lenin was the first one. Lenin said there would be no Soviet Union without Ukraine. But Russia is too weak to construct a bipolar world and to build up a Berlin Wall. But it is strong enough to create numerous problems for Ukraine. I’d like to underscore that the conflict we have is not a bilateral conflict between Ukraine and Russia. It is a global one. What Russia did violated international law by grabbing the land of an independent country. In 1994, when we signed the Budapest Memorandum, we relinquished our nuclear arsenal and got nothing except Russian tanks in Crimea. At the time you got [security] guarantees. We got signatures. There’s a difference between guarantees and signatures. Do you feel let down by the signatories? What about the U.S. and Great Britain? The U.S., the U.K.—mainly the U.S.—are quite strong in imposing economic sanctions over Russia. We understand that the administration has a number of constraints, but despite this it seems the U.S. is the most decisive in [pressuring] Russia. The way Putin acts is very simple. He makes a step and then double-checks what is on the ground. If the price is very high, he won’t step. Which means he has to be opposed? But he’s not meeting any resistance. That’s true. There is a pressure, but this pressure is not as strong as [is] needed to stop President Putin from moving further and further. Is it true that at Geneva there was no talk of Crimea? In the statement [issued afterward] there was no indication of the Crimean annexation. But during the press conference, three out of four [foreign ministers] said they would never recognize Crimean annexation. Did they basically allow Putin to do a land grab? Basically there is no way to stop this kind of thing except military options. To wage the third world war is not the best-case scenario. Another option, which is an economic one, has implications on both sides. Not for the U.S. but definitely for the EU. So do you feel the EU should be stronger with its sanctions? I feel the EU and the U.S. need to act in concert. I feel that Russia needs to realize that as a P-5 member [permanent member of the U.N. Security Council] and a former G-8 member they need to stick to their international obligations—otherwise they have to pay a very high price. Even without Russia you already have a big job reforming the economy. The primary task is to survive. If we survive, then we need to reform the economy. We have already passed austerity measures. But then you will have to keep public support for these austerity measures. I’m not sure the public will be happy. We passed [economic reforms] … we doubled the gas bill, we shut down a number of social programs. We passed very painful reforms and that is the price for not having reforms in the last two decades. On top of this, you have Russians on the border? On top of this we have massed Russians at the border, security forces inside, political clashes in the house—it’s all about politics. We are running a huge budget deficit, the foreign reserve account is dangerously low, and the exchange rate dropped by 50 percent. But we succeeded to survive the last two months. Do you think you’ll survive the next two months? Is your first job to calm down the east? There is no first job. You have to do everything all at once. To calm down the east, to change the constitution, to get the [International Monetary Fund] loans, to have free and fair elections, to overhaul the Ukrainian military, to sign the [free-trade agreement] with the European Union. Is the U.S. giving you enough military aid to build up the army? The U.S. supplies us with nonlethal support. How do you build up your army? I’m trying to find an appropriate answer. We do understand that we need to rely on our own resources. But you will need money to purchase military equipment? The U.S. issued $1 billion in loan guarantees. The IMF supports us. We are getting support from the EU. When I listed my agenda … I forgot energy reform. We have no gas. Consumption is about 47 million cubic meters. So we need to buy gas from Russia or from other countries. That’s another $10 billion. Russia just doubled the gas bill for Ukraine. We have a definition of “brotherhood relations” between Ukraine and Russia. Today I figured out what that means. It means $500 for 1,000 cubic meters of natural gas and tanks in your country. Do you need to diversify your energy supply? There is the option of reverse flow through Slovakia and Poland. It is a good option, but we cannot facilitate this reverse flow with Slovakia because there are a number of legal impediments. Russia’s Gazprom blocks this reverse flow. Doesn’t Ukraine need to be more energy efficient? We are No. 1 in the world in terms of energy consumption per dollar of GDP. You were in the Maidan. You were one of the people who signed the agreement brokered by Polish Foreign Minister [Radek] Sikorski and the German and French foreign ministers. What do you think of that looking back? I think we did the right thing. We collected votes in the house, and we ousted President [Viktor] Yanukovych. But the Maidan rejected the agreement. Maidan didn’t accept the agreement. But at that time, it was reasonable to sign this deal. We bought time. As Yanukovych fled the country, his supporters defected and joined a new coalition four hours after the signature. It wasn’t well accepted by the Ukrainian people—they are not politicians. They felt that we betrayed them, and we felt that we outplayed Yanukovych. But we paid the price in our approval ratings. You wake up in the morning and you have to figure out how to get an army that works? How to feed the army and how to fill the tanks. Where to get the tanks? The army is big, but it’s all about efficiency. Is the army infiltrated by the Russians? Would you like to see the U.S. share more intelligence with Ukraine? I don’t want to go into the details, but we have good cooperation with the intelligence community. What are you looking for from the U.S. that you haven’t received? We’ve got what they can deliver. We have really good relations. Nevertheless, you are left with the Russians on your doorstep and your army not functioning. The price for ammunition for one Russian soldier is about $13,000. The price for a U.S. soldier is $23,000. The price for a Ukrainian soldier is about $1,800. About 2 or 3 o’clock in the morning I check the Internet to see if something has happened—another crisis, more violence, another building seized, another Russian spy or agent. In the last five days, thank God, nothing has happened. They tried but didn’t succeed. If Putin wants to do more here, does he have to send in troops? He won’t do it. At this particular period, Ukrainians who live in southern and eastern Ukraine don’t support the Russian president. He could get additional support [in Ukraine] if we face social problems, if people are unhappy with austerity. He will be waiting for this. He will create problems, and he will wait for the problems that we are creating by ourselves. While you work on the economy, you will have to keep an eye on the Russians that are in your country? The security services detained a number of agents with an FSB [successor to the KGB] background. So they are in the country and have been here for a while? This was a preplanned operation. They started infiltrating the Ukrainian government a few years ago—the government, the military, the security forces, and the state-owned companies. So it wasn’t the Maidan that brought the Russians here? No. You have to know the Russians. The Russians never trusted Yanukovych, but they used him as access to Ukraine. They were very familiar with what Yanukovych was like—they knew he was a corrupt man and easy to intimidate. The real plan was to change Yanukovych in 2015 and to have a new pro-Russian president and a new pro-Russian majority in the parliament. This was the dream of President Putin. So do you think the West was asleep? When President Putin [said] that the biggest disaster of the 20th century was the collapse of the Soviet Union, did the West think he was kidding? He wasn’t. No one heard this. The West was deaf to his speech but he wasn’t kidding. He invaded Georgia in 2008 and has now moved to Ukraine. Then he supported Bashar al-Assad in Syria. The Russians like to back these kinds of bastards. They don’t care about red lines. They redraw them in other colors. So the U.S. didn’t follow through on its threat about the red line. Did Putin see the United States as weak? He saw [that] there is no power to stop him. He is a big, sophisticated political animal. He scrutinized every other political animal on the globe and realized that at this particular time, he has no impediments. It is a disaster for the world, and we need to take lessons from the last century. Europe had a bad record in 1938, and we are not allowed to repeat the same stuff in 2014.